I have a definitive perspective on buying for baby. In general, invest in items you know or want to last the test of time, recycle old ones where you can, go inexpensive on the “throw away” items and find bargains on everything. After all, who needs retail. 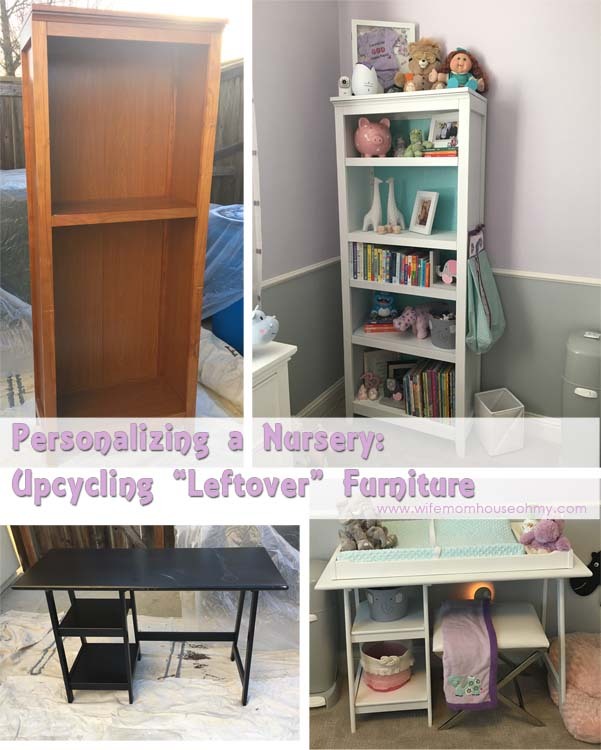 So when it came to furniture for our baby girl’s nursery, I looked for areas where I could save some cash by reusing items we had in our home that well needed a new home. As it turned out, we were planning on some remodeling that would eliminate the need for certain furniture pieces as well as I had inherited some additional furniture pieces from my mother. I knew I ultimately needed a crib and dressers so anything else I added to the room needed to coordinate with these new items. I also designed and built her room around the concept of it growing with her. 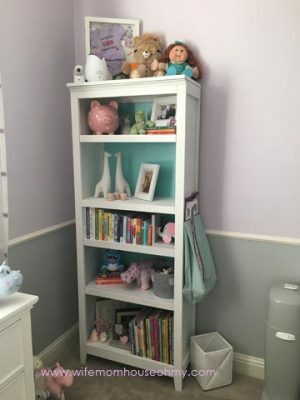 The paint choices, the furniture choices, even the accessories were all chosen with the concept of it being able to function beyond just her baby years. I knew I wanted a bookshelf for her room and a “change” table for her. Yes, I know I could have used her dresser but as I planned to put it under the window, I really didn’t want to be changing my sweet baby in front of the window. Hence, I was ideally looking for a separate piece to serve as her “change” table. So when it came to upcycling some of our existing furniture, I stole my husband’s old bookshelf and snagged my mother’s old sewing desk. 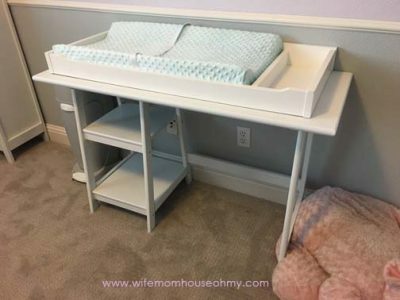 The bookshelf would serve as well her bookshelf and the desk would serve first as her change table and later as her desk. But given the furniture I had selected for her room was a beautiful matte white, the country color oak bookshelf and modern black modest shine desk really weren’t going to work in her nursery. Upcycling time! Here was my plan: Her room colors came from her bedding quilt, which thankfully had a lot to pick from. The main colors were soft lavender, soft gray and white. But it also featured a bright bold green, pink and a soft aqua. 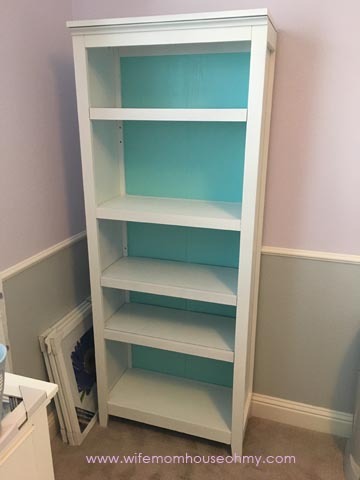 Based on all the color plays around the room, I knew I wanted to have the soft aqua as a feature color in the upcycling of the furniture. Tip – When using accent colors or pops of color, make sure that they flow and don’t look awkward. Use them at least twice around the room and in opposite locations around the room. For the desk, it would go completely matte white to match the new furniture that was going in the room. As for the bookshelf, the exterior and shelves would be painted the matte white to match the crib and dressers going in the room. But the interior back wall, well that needed a pop of color! Soft aqua! Not only would it add some much needed whimsy to the palette but as many of her accessories were white, it would also provide a good back drop for the decorative elements that would be going into her bookshelf. Let’s talk paint for a minute. I have always loved the adage, “You get what you pay for.” And boy did it prove true on this project. 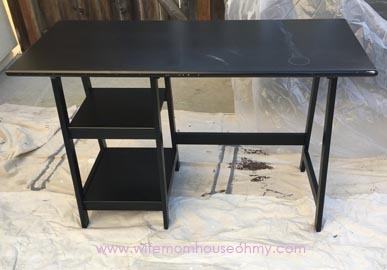 Typically when I have done recoloring projects of lower cost furniture – melamine covered pieces, lower end wood pieces and even plastic, I opt for Krylon or Rust-oleum. I find that I get good coverage that lasts, no bubbling and I don’t use that many cans. Now as far as cost goes, they are definitely higher end spray paints. When my husband and I went to Lowe’s to purchase a variety of things for little girl’s room, I decided I’d grab my spray paint. My husband, God bless him, has always been a saver and his perspective is spray paint is spray paint. When it comes to standard paint, I’ve opted for Valspar as it offers good results and good coverage. 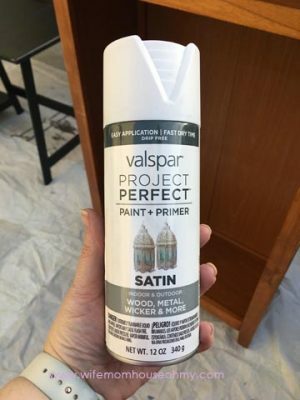 So when my husband suggested getting the Valspar Project Perfect Paint + Primer because it was half the price of the Rust-Oleum and the Krylon, I really didn’t question the results or coverage. After all, I’d had good luck with the standard paint. In fact, it was what we used for baby girl’s room. So I bought 7 cans. 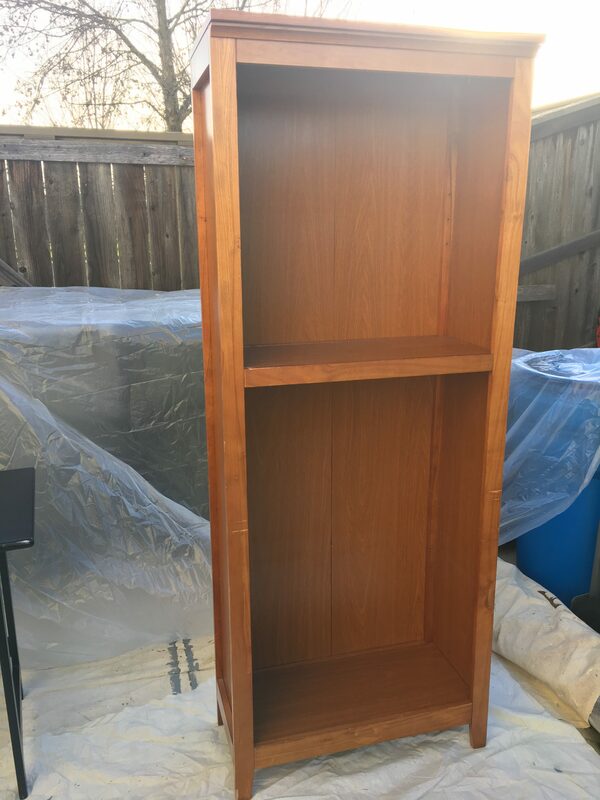 Figured I’d need three to four for the bookshelf and probably two to three for the desk – thinking about 6 really would do it but I’ll buy an extra just in case. Oh let me tell you! I ended up using 12, yes 12, cans of spray paint and barely finished my project. The cost ended up about the same – around $45.00 total – that it would have had I just used my regular Krylon or Rust-oleum. But the challenges I had with the paint itself made the process that more frustrating. 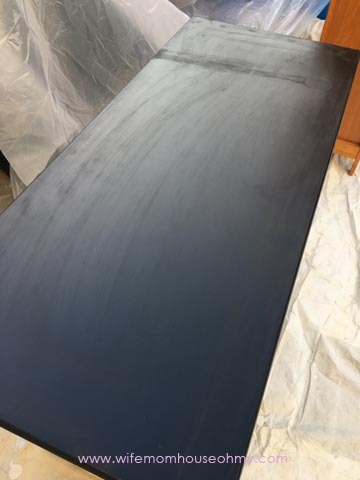 Every spray paint I’ve used has always said, including this one, do multiple coats within one hour of painting or wait at least 24 hours before proceeding with a second/another coat. However, this one bubbled and lifted even after 48 hours of waiting before proceeding. Tip: If this happens, just gently press down on the wet paint with a gloved hand. Don’t rub or brush. Let dry and you can either lightly sand and repaint or if not too cracked, then you can just spray over. Lesson learned here is “you get what you pay for”. For these types of projects, I will definitely be sticking with what I know works! Now back to the project at hand. Prep is always first. Even when you have a paint and primer in one, its best to make sure your surface will hold paint. A very fine grit sand paper run over the surface of any piece that has a smooth or glossy finish is a wise move. In the case of my bookshelf and desk, a light sanding really didn’t effect the overall finish but it made small “grip” areas for the paint to adhere. Next, wipe down the surface completely! Dust is not your friend when painting, especially spray painting. A lightly damp rag will get up all the dust from your sanding and any dirt, no problem. Next, prep your area. Put down drop cloths so your paint doesn’t leave an “impression” on your yard. I also suggest if you are working in a more closed in area that you also lay cloths over areas you don’t want paint to drift. For example, I painted on the side of our house and really didn’t want our shed or fence to take on a white tint, so I draped cloths over these areas as well. Tip: Pick a warm, dry and non windy day. Not only will this help the paint dry faster but it will help prevent or limit blowback from the spray paint. Next, prep you. Blow back will happen. Period. Just gonna happen. Even on the windless day possible. Dress in something you don’t mind changing colors and opt for a mask and eye coverage. Trust me. You really don’t want spray paint flying in your eyes or up your nose. Particles from the paint linger in the area. The mask and eye coverage keep them out of sensitive areas. Time to paint. The key in my opinion when it comes to spray paint is even strokes that lead to even coverage and color. Spray paint itself doesn’t flow in this nice even stream. Have you ever seen at a fair the artist that airbrushes splotches and then all of a sudden a piece of art appears. If you have then you are familiar with the center having a depth of full coverage color and the outer edges being fuzzy and allowing the background to show through. Spray – no different. So when you spray, you want to make sure you are addressing these edges. The easiest way to do this is to make sure always go past the edge of your project so that stop marks aren’t on the project itself. Next, you want to make sure you vary your direction. First, by going horizontally over the whole project. Second, using vertical strokes over the project and, for added measure, lastly, at a diagonal. Doing this will almost always guarantee excellent coverage of a project. If you are planning on doing a second coat, do so within the same hour of when you applied the first layer of paint. If not, you will want to wait AT MINIMUM 24 hours between coat of bubbling can occur. Once I was finished with my white spray paint job, I let them dry. Most paints that I have used will be cured enough to move within the first 24 hours. But before you use any water or cleaner or set things on the projects, I fully recommend waiting a minimum of 72 hours to allow the paint to fully and completely cure. The last thing you want to do is ruin your precious items or your paint job. So be patient – I know sometimes the most agonizing thing to do and I speak from experience on this one. I’m the worst. At this point, my desk converted to changing table was done and ready to be moved into baby girl’s room. The bookshelf needed an added touch of color. Tip: Who needs a whole can of paint when doing small areas. As long as you are fine with a satin finish, sample size paints are perfect for the small jobs. Sample size paint in hand, I used a sponge brush to get a similar texture of paint to the spray paint. Remember when you apply paint, your application tool has a distinct look to it in the applications. If you want a smooth finish best to use a sprayer, spray paint or foam brush. Brushes will leave the brush marks and streaks. These strokes are often seen and look good on antique furniture prices or even farm style cabinets. Rollers often leave pitting or pockets in the paint. Its a small and minuscule detail but for me its enough to mess with my obsessive compulsive nature. Most people wouldn’t notice. But spray paint, sprayers and foam brushes leave that smooth finish and works great when using a higher shine finish – high gloss, gloss, satin. Personally, I always do the perimeter of a piece, cutting the edges before moving on to the center panel. Letting it dry between coats helps prevent peeling and chipping. But given this is a flat surface that wasn’t a huge concern. Again, as with the spray paint, you want to let the hand painted area fully cure before putting anything on it. Once dried, I moved both the bookshelf and the new change table upstairs into baby girls room. Love how they look in place and fully decorate. 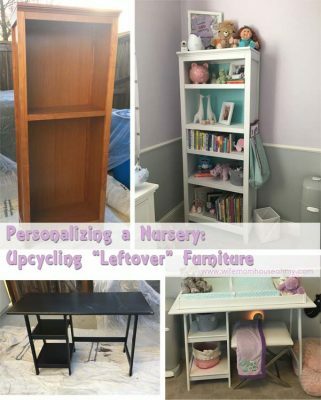 These two upcycled furniture pieces can transition with her as she grows and the best part…I didn’t need to buy new piece. 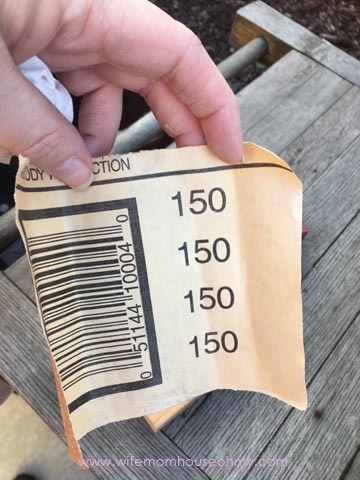 I saved tons of money AND kept these pieces out of the landfill. 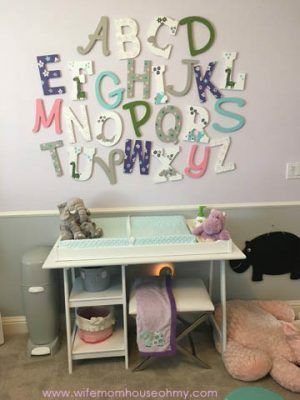 Its taken a while, from a blog standpoint, but the next post is my reveal of baby girl’s room followed by how we pulled off a designer look without a designer budget.